Kraemer Brew experienced its first true hop harvest this fall. And what a harvest! After losing two plants (R.I.P. willamette and magnum) and only reaping a few handfuls last year, I wasn't sure what to expect. The cascade plant climbing up the western corner of the deck and the chinook plant along the western fence did spectacularly. Both were extremely prolific, especially the cascade. I can't wait to use these in a mid-winter IPA or pale ale to really get a sense of their character! Meanwhile, the centennial plant, climbing up the eastern corner of the deck, and the fuggle plant in the corner of the western fence, also did well. However, neither receive as much sunlight, so it's no surprise that they were not as bountiful. The centennial cones were the first to be ready for picking. The fuggle were the last. Since both resulted in a limited supply of cones, I didn't bother weighing the finished product. Since then, I used both to dry-hop a cider in late November. At that time -- after spending a few months in a freezer -- a had roughly 0.25 oz fuggle and 0.75 oz centennial. Looking back through my notes, I see that I failed to blog about the initial planting and experience last year. Here's a quick summary to bring you up to speed. I found this article by Brewing Techniques to be straightforward and helpful. Planting. I located places along our fence line and deck to allow the hop shoots to climb and receive adequate sunlight. Since Madison's soil is largely thick clay, for each hop rhizome I dug out roughly a 2' x 1' hole and replaced it with a mix of compost and silt. This allows for proper drainage and space for the root to expand. After filling in the holes, I planted the rhizomes just below the top layer of soil, maybe an inch deep and gently patted the soil down, being careful not to compress. I planted in late April and within 3 weeks had my first few shoots. Care. 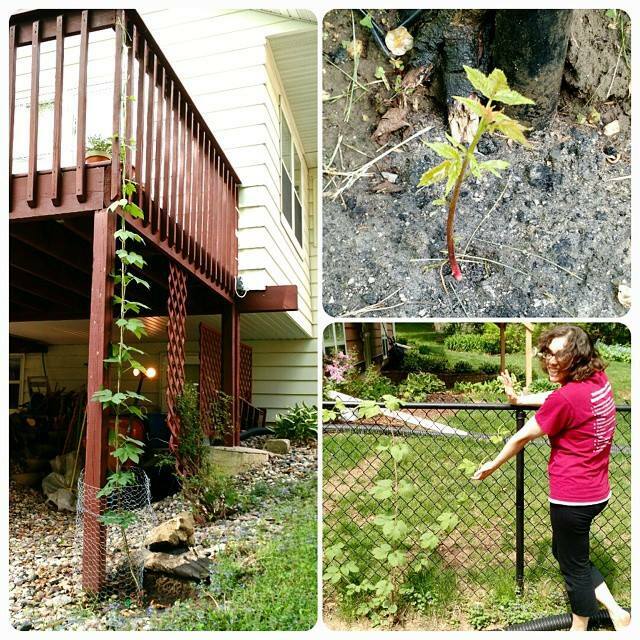 Once the shoots were 6-12 inches in length, I assisted their climb by wrapping them around twine tied to the top of the fence or deck and staked near the plant. I then selected the 3 dominant shoots of each plant and prunes back the rest. We had a warm summer last year, so I water every 2-3 days for the first month or so, until I felt that the plants were self sustaining. From there, I pinched off leaves near the ground to help prevent disease up the plant and continued to guide the vines by wrapping them up and along the fence and deck posts. This past spring and summer, I did almost no watering. Aside from once again selecting 2-3 shoots, pruning back the rest, and assisting their climb up the twine, I did almost no work to care for the plants. Harvesting. I waited until late August to begin regularly checking the cones to determine if they were ready for harvesting. The centennial hops began to feel dry and papery first, with a few turning a lighter shade of green to brown before I decided to pick. Cascade and chinook came due in early September. 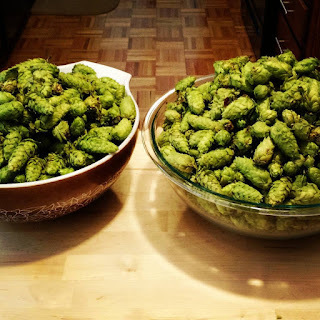 Rather than cutting the bines, I methodically picked those cones that felt ready to harvest. I did this over the course of about a week. I then left the bines until later in the fall to cut them down to the ground. The fuggle hops were the last to be ready to harvest. Drying and Freezing. 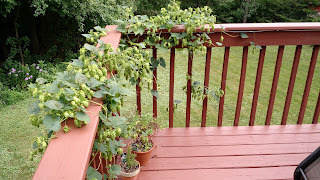 As I picked the hops, I moved them to our basement and spread them out over a few large window screens. I used a box fan to direct air across the hops to help them dry more quickly. After three or four days, the cones felt dry and papery enough to package. I stuffed as many hops as possible into gallon sized ziplock freezer bags and then squeezed out the air by rolling the bags closed and using a straw. Not as effective for long term storage as a food saver vacuum sealer, but should keep the hops usable until I can make a hoppy beer this winter. I packed the bags into our large chest freezer until then. Final thoughts. 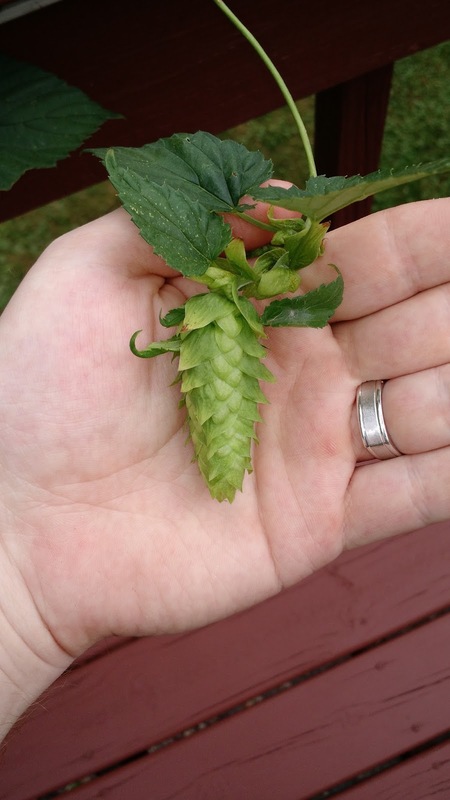 Growing hops is easy. The plants require some loving care the first season as they establish themselves. But I did very little the second season to maintain them and still wound up with a nice harvest. Any homebrewer who has yard space should plant hops!